Convert DWG Task – ehcanadian Consulting Inc. Convert DWG Task (Formerly Convert With DraftSight) is a SolidWorks PDM task add-in that converts DWG files to PDF and DXF. NEW! – The add-in now has its own built-in PDF generator. 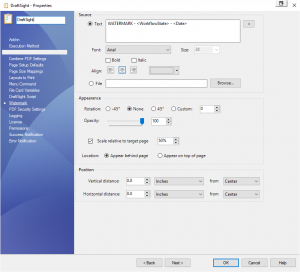 DraftSight or AutoCAD are no longer required but are still supported! The add-in includes a built-in PDF generator, or it supports using AutoCAD’s or DraftSight’s scripting capability. DraftSight is free, so you won’t tie up a license of other software to convert your DWG files. This add-in uses the free version of DraftSight. As of version 250, DraftSight, AutoCAD and AutoCAD LT are supported. SOLIDWORKS includes a DWG to PDF add-in using DraftSight. However, that add-in is quite limited in functionality. Upgrades are $195 for the next major version of SOLIDWORKS PDM. 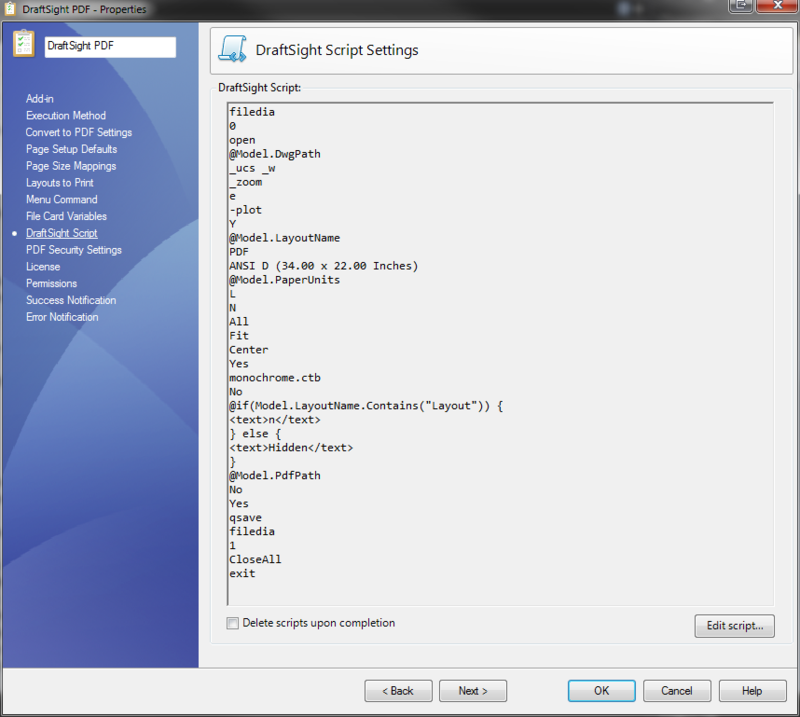 DraftSight or AutoCAD must be installed on the computer running the task if you’re using scripting. Drag and drop the add-in from the cex to your vault. Select Convert DWG Task in the Add-in combobox. Configure your task. The set up should be self explanatory. Now, either setup your workflow to add the task to a transition, or right click on a file and select Convert with DraftSight. A trial is available and it will run for 30 days. After the trial period has completed, a subscription is required. Please note that these versions are no longer being developed and updated. Added support for AutoCAD 2018 (R32) files. Added additional method to determine if layouts are empty. Changed licensing – the add-in now uses a subscription based license using the PDM License Manager. 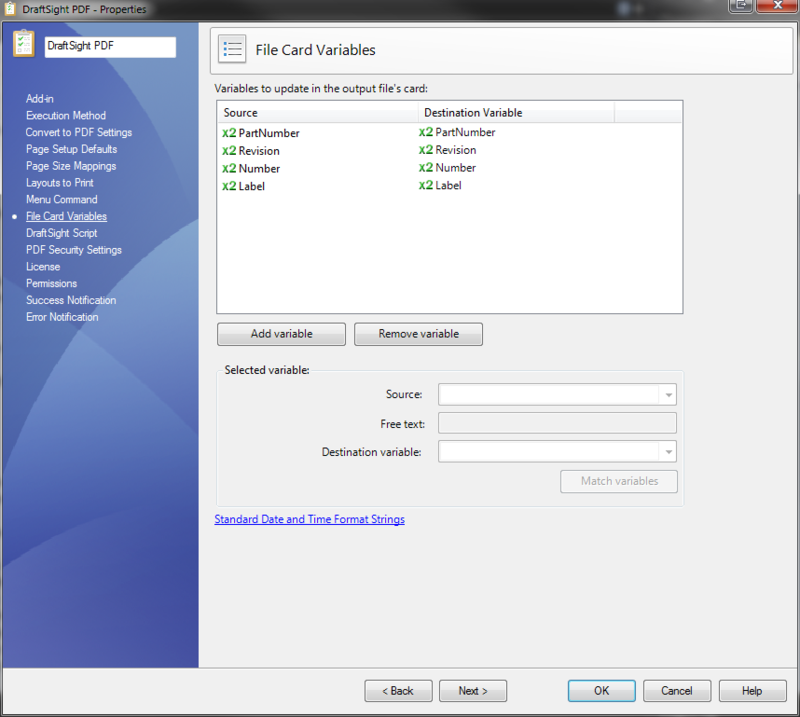 Added FolderPathNoVault variable which gives the path to the source file with the vault removed. Watermark text may be entered by the user who initiated the task. Watermark text is replaceable via scripting by using the WatermarkText variable. 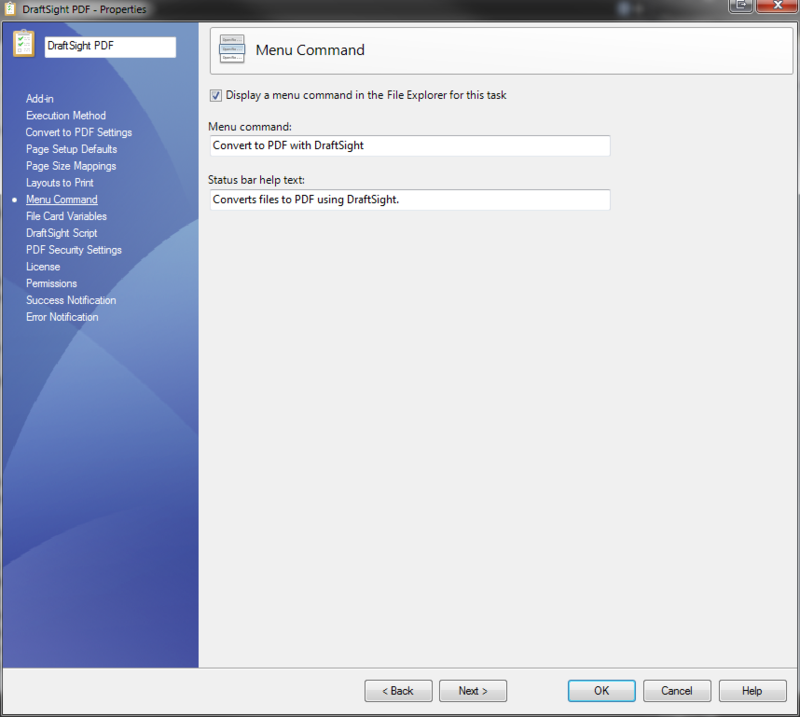 Environment variables are supported in the temp directory path. Layouts that do not contain any entities are not processed. Layouts are sorted by layout name. Ability to only run scripts and not process source files. Timeout and skip fails registry entires. Fix for including model layout. Added the ability to combine PDFs that pass through the task. Added the ability to not include the model layout when converting all layouts. Fixed a bug with the add-in not finding the block page size. Fixed a bug with the task details page generating an error. Fixed secondary path not recognizing rooted paths. Added RazorEngine for script generation. Fixed – Interop issue. Task properties were not being displayed correctly. Fixed – Spaces in filename bug. Added – Page size replacement functionality. Added – Ability to specify layout to print. Lee’s Convert with DraftSight Add-in has been fantastic for us with EPDM. We needed an automated way to create PDF’s and DXF’s from DWG files. The built-in solution for EPDM (that uses SolidWorks to process DWG files) just did not provide the high fidelity of conversion to PDF, especially with GDT notes and other symbols. Using DraftSight to produce the PDF and DXF files ensures that we get a great quality conversion. We worked with Lee to get the functions of the add-in just right while he was in development. He graciously added capability as we needed for the DXF out and the ability to use variables in the file name or folder path. The ability to modify the script that runs in DraftSight for each task that runs with the add-in has allowed us to automatically bind all XREFs in our files before we create the DXF file to be sent out to customers. Lee was a real professional to work with and it really shows in this add-in. 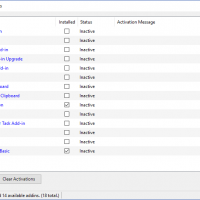 The EPDM community will be greatly served by this great Add-in. Specify the path to DraftSight on the computer running the task. The task will check for the correct path at runtime and will specify an error if the path is not found. Specify the path to save the generated PDFs. If the folder resides outside of the vault references will not be created. Specify the secondary output path if desired. The secondary path can be relative to the source or destination file. The temporary path is required. DraftSight does not support file names with a space (either in the file or the script path) so the add-in copies the source file and script to the temporary path to work on. The files are removed from the path when the task is complete. Indicate if the task should replace existing files or create new versions. 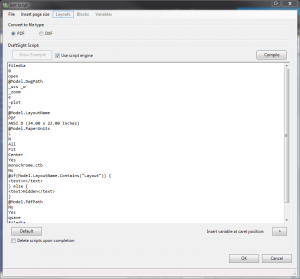 Specify the folder to place log files in. If the log folder path is blank logs will not be written. 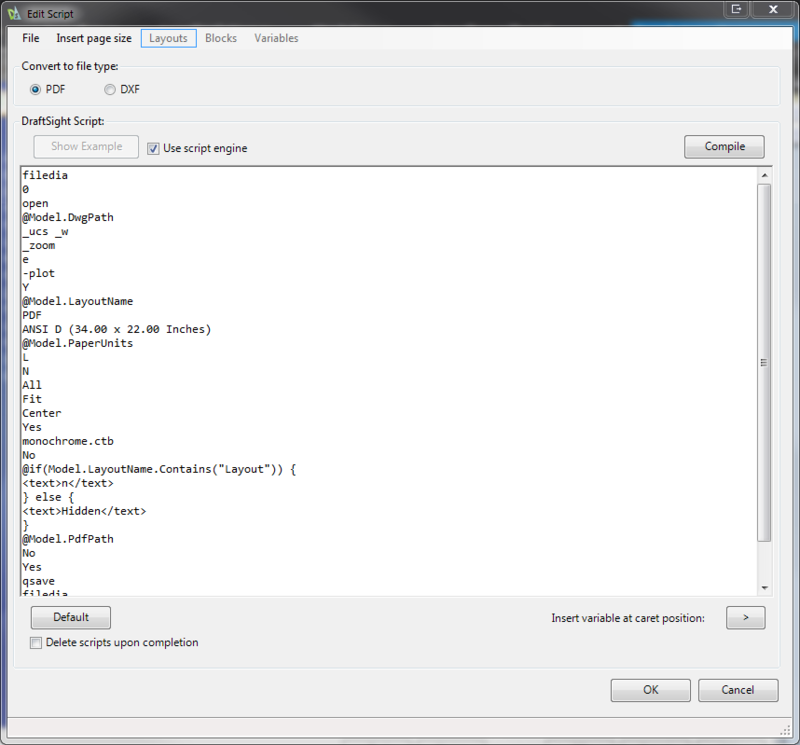 The task uses a DraftSight script to generate the PDF. There are variables that are read from the DWG file to create the script. The available variables are listed in the drop down. You may need to edit the script to achieve the desired output. The script is output to the temp directory. The Default button will insert the default script into the text area. If ‘Delete scripts upon completion’ is checked, the task will delete the generated script when the task is complete. Unchecking this option is useful for troubleshooting. New in version 2:The add-in now uses the RazorEngine templating engine for it’s script generation. To test a script, load a file from the File -> Load drawing menu. Select a layout to work on from the layout menu. Pressing compile will attempt to compile the script against the loaded drawing. More documentation on this to follow. The task will attempt to read a block containing the string specified by the text ‘Block name’. If it finds a block, it will search for an attribute with the name specified by ‘Attribute’. It will attempt to match a page size accordingly. If a block is not found and the DWG does not contain relevant information to choose a page size, the page defaults specified will be used. Layout to print: DWG files contain sheets/layouts. Specify the layout to print in the textbox. Note, properties are read from the specified layout as well. If the textbox is left blank the Model space will be used. DraftSight’s PDF printer only supports specific paper sizes, and those may not match what is specified in your drawings. If your DWG’s were created to plot to a specific printer, you can map the page size to a PDF size in the page size mapping section. If you find that DraftSight is hanging when the task is executing, try specifying a page size. 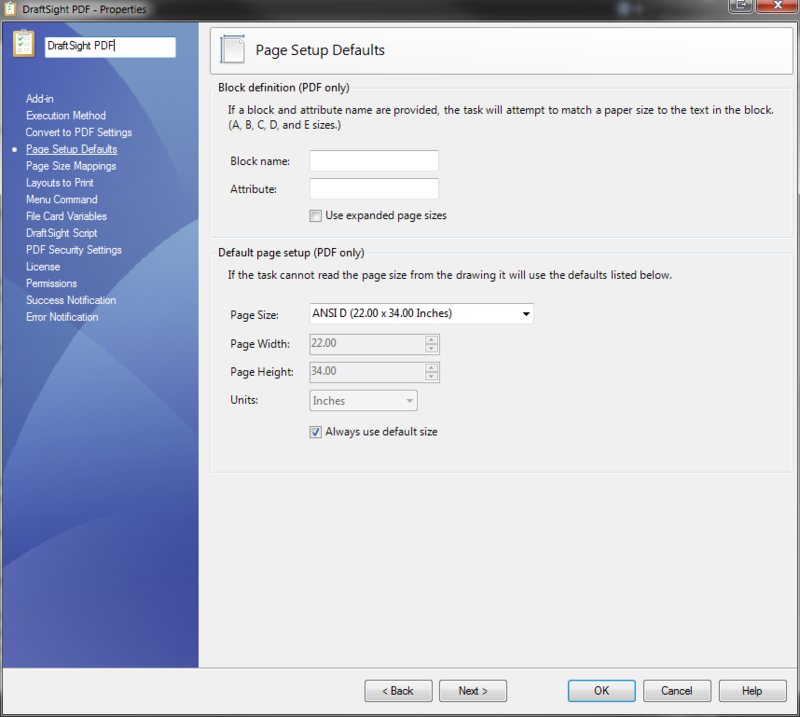 The task supports updating the generated PDFs file card. Along with variables from the source DWG, the task supports Free Text and Other EPDM variables, as well as Date and Time functions. Source file name The filename of the source file. Source file path The path to the source file. Source config The active configuration of the source file. Source revision The EPDM revision of the source file. Source version The EPDM version of the source file. Source workflow state The current state of the source file. Conversion date and time The date and/or time the file was converted. One can select to have the generated PDF expire after the specified number of days, as well as denying or permitting the specified settings. Specify the text to be displayed in the context menu in Windows Explorer. Specify the help text to be displayed in the status bar in Windows Explorer. The license provided is an evaluation license that is good for 150 executions. After which PDFs will not be generated. If you have any questions or need support, please email info@ehcanadian.ca.